Chile Chipotle is a medium–hot, smoke-dried jalapeño chilli. 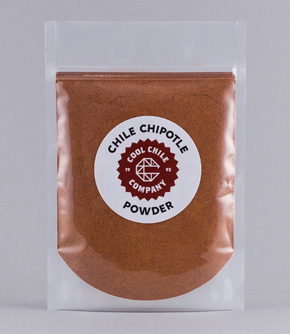 Our powder is made from ground whole chipotle chillies. Small, thick-fleshed chipotle chillies are one of the most popular and well-known Mexican chillies, with a unique smokiness that works particularly well with anything slow-cooked. Sprinkle over buttered boiled sweetcorn along with finely grated pecorino and a squeeze of lime juice for Mexican-style corn on the cob. Powdered chillies don’t require any soaking or toasting so just add directly to whatever you’re making. Chipotle (chi-poht-lay) chillies are made by smoke-drying jalapenos. The name comes from the Nahuatl word ‘chilpoctli’, meaning smoked chilli.